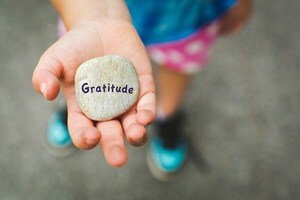 Gratitude Attitude in our Children: Why and How? Thanksgiving is the time when we all pause to count our blessings, to give thanks, to be with family and friends, and to be grateful. While it is always good to stop and focus on gratitude at this time, it is even better to continue this attitude of gratitude all year long if we are to experience the benefits. Isn’t it true that we all want our children to be grateful and to express that thankfulness, and the opposite is also true - we do not want our children to be ungrateful, greedy or to act “entitled” or “spoiled”. So what can you do to help foster that attitude of gratitude and what are the benefits for your children? How? How do we inspire and teach gratitude? What can parents do to help children learn to be grateful? There are many things you can do and it all begins with YOU. You will teach your children to have gratitude when you do and when you express that gratitude - you MODEL the behavior and attitude you want. When children grow up in a home where gratitude is a language that they hear consistently, they too will learn this language. Say “please” and “thank you” to your child, to your spouse, your friends and to strangers at the mall and in the restaurant. Start it early, do it consistently, always, and make it part of your language. You will teach your children to have gratitude when you stop giving them TOO MUCH. Dang! I hate this one! We all want to give to our children, to shower them with gifts that we call affection. Here’s the deal: It is possible that when we do this, they learn that they get whatever they want; they make more demands for more stuff; and they do not learn to appreciate or be grateful for what they have. So what’s a parent or grandparent to do? Turns out, there are things you can do to help. Think of giving too much as broader than just on the gifts. Perhaps, you give too much in activities and your child is overscheduled and so are you. Maybe, you give too much time and attention and your child is unable to entertain himself, be content alone, or demands you spend too much time and energy on him at the expense of others and your other relationships or at your own expense. Perhaps, you give too many toys so they don’t even enjoy what they have or play with them and instead always want another new toy. Identify the areas where you might be giving too much and instead of teaching them that you love them (your intent), they are learning these other things that you do not intend. Turn this around by helping your child show and tell her appreciation. Talk about the gratitude and ask them to tell you what they appreciate about having that toy or doing that activity. Talk about ways you all want to express our gratitude and appreciation. Establish the expectation that we write thank you notes to show our appreciation to Aunt Cheryl or GiGi. We tell people how much we appreciate their thoughtfulness. Also please know that it is a normal reaction to get angry, upset, disappointed and sad if you don’t get what you want - and that is true for children and adults too! You will allow your child to have these feelings for they are simply that - feelings. You will acknowledge them and may help your child name them, “I know it is hard not to get a toy when we go to the grocery store, and that you are sad about that.” You might just listen to your child beg (and you will not need to talk or try to reason with them). It is not helpful to rescue, take away or fix her feelings; just allow her to own them and process through them. Believe that your child can work through his angry or sad or disappointed feelings because they can and that is how they learn to accept and process their own feelings too. You will teach your children to have gratitude when you help them learn the CONCEPT OF ENOUGH, when enough is enough, and when they have enough. Please know that this concept takes time to teach to children and adults. Let’s face it, we all have difficulty with this! When do we eat enough, drink enough, have enough black pants, buy enough TVs or enough toys? Again, when we start with ourselves, only then can we begin to give away that understanding to others. Teaching them “that is enough” helps your child learn moderation. Using words “That’s too much.” “Oh, we overdid that.” “That is more than you need” and modeling, “That is more than I need.” “No, thank you. I have had enough.” will help your child begin to understand this. You might decide together, “How many books would be enough to get at Barnes and Noble today?” or “How much money is enough to spend on a pair of jeans?” “How much candy would be enough for you to get a treat and enough for your body to be able to handle?” Talking through the “enough” concept helps your child learn to regulate themselves too. You will teach your children to have gratitude when you help them learn that their value does not come from external things - VALUE THEM FOR WHO THEY ARE - not what they do or what they have. Help your child see that it is not their things or winning that makes them valuable, instead, it is who they are inside, because they are a gift to you and that you just love them...period. Before you begin on your child, first stop and ask yourself, “What messages am I sending about how much I value physical appearance and image, money and wealth, possessions and comparisons, or titles and status?” You might start there if you find yourself tempted by the “glitter” too. Please know that having money and things is not a bad thing; in fact, many good things can be done with money. It is harmful if those things have you or own you. As you watch a movie together, talk about how the characters are saying “please” and “thank you” and notice when you see gratitude displayed. Use the same conversation starters that you use when reading together. At the end of the movie, stop and share together. “ I am so glad that in the end, the children decided to give to others and be grateful.” I love how he learned to share and be thankful. Movies, such as, “Charlie Brown’s Thanksgiving”, “The Rescuers”, and “Cars” can spark good conversations about gratitude. You will teach your children to have gratitude when you GIVE and you teach them to give. It is more than bagging up toys your child no longer wants; it is giving time, energy, service and love to others. Volunteer and give as a family. Rake your neighbor’s leaves and shovel her snow. Get your elderly neighbor’s newspaper from the paper box and take it to him every day. Fix sandwiches for homeless people. Go and sing or just sit and visit with people at an assisted living or nursing home. Make it a family practice to give to others. Encourage your child to give. Your child might make and give cookies to a child who moved into the neighborhood or to someone who needs a bit of good cheer. Make cards together to welcome families to your neighborhood, church or temple or to send to a relative. Ask your child to share money and give to the Salvation Army kettle. Adopt a Christmas Angel together (a child that is the same age as your child) and have them pick out the toy or coat for that child. You will teach your children to have gratitude when you help them DEVELOP SPIRITUALLY. Being part of a faith community, church, temple, or mosque can help children understand gratitude as part of their service and love. Messages of gratitude and blessings are frequently part of the spiritual teachings. Connecting to a community who serves others provides another opportunity for your child to give to others and serve alongside others too. Personal prayers, blessings, and meditations can help children focus on gratitude, kindness, and love for others. Just as important as knowing what to do is knowing Why? Why is having an attitude of gratitude so important? Why is it worth the effort? What are the benefits? Turns out, the benefits of cultivating an attitude of gratitude are many for adults and for children and goes beyond just being nice. Studies by Dr. Robert A. Emmons of the University of California, Davis, reveal numerous health benefits, such as lowering blood pressure, reducing risks for depression and anxiety, and improving immune functioning. Additionally, there are positive impacts on choosing healthy behaviors and gratitude can block negative, harmful emotions. In fact, people who practice gratitude are happier people. So who doesn’t want all that? May this Thanksgiving and every day, be a reminder for each of us to be a bit more verbal about our gratitude, to count more blessings, have more self-awareness, be more intentional, practice gratitude daily, understand the benefits and to grow in our attitude of gratitude. We can all be thankful that it benefits our own health and happiness and makes a positive impact on the lives of our children. I’m grateful for that.